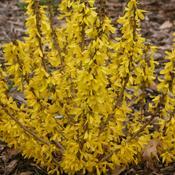 Like most Forsythia Show Off is a good grower, so prune frequently to create a full container. Do not prune after mid-July, buds set in early fall. Should not be forced into flower in the greenhouse. Show Off®, this miniature, upright selection delivers more flowers per inch to create an outstanding spring display. A very compact, dwarf plant which provides lots of spring color in a small space. 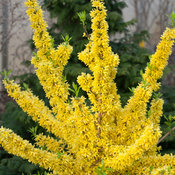 The Show Off® Starlet is a bright ball of yellow flowers in spring! 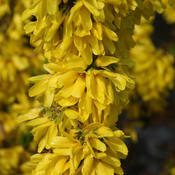 This new dwarf forsythia is a mass of bright yellow spring flowers from base to tip. The Show Off® has bright yellow early spring flowers. Dwarf habit. Outstanding flower display. Deer resistant.